Our group of Montreal Book Bloggers has grown. We are officially 19 members! We met again on Oct 1st for lunch at Boccacinos to get to know one another better and to trade books, of course. This time 13 of us were present. Lucy at Moonlight Gleam's Bookshelf, Cindy at Cindy's Love of Books, Amanda at Tales and Treats, and Ilana at From Smiler, With Love. I got all these wonderful books from my fellow bloggers! Thanks girls! Donna also gave everyone a versatile plastic book cover. Robyn takes you inside her deepest thoughts and fears, as well as her chronic anger and thoughts of suicide. After being diagnosed with a "bad state of mind" called dysthymia, Robyn wrote Born Mad to help others who may be unaware that they might be suffering from a low-grade chronic depression that will make life difficult, ruin relationships, and contribute to a negative and hopeless outlook on life. Born Mad includes symptoms of dysthymia and coping strategies, as well as the story of how Robyn came to believe in God, defeat chronic anger, and become the person she was meant to be. Those meet ups sound like so much fun! I hope you enjoy your books! Enjoy all your new books! I should really read Wither soon. What a great event! I loved The Happiness Project...hope you enjoy it, too. Lots of good books from your blogging friends! Those meetups must be so much fun! Enjoy all your new books. Sounds like the meet up was a success! 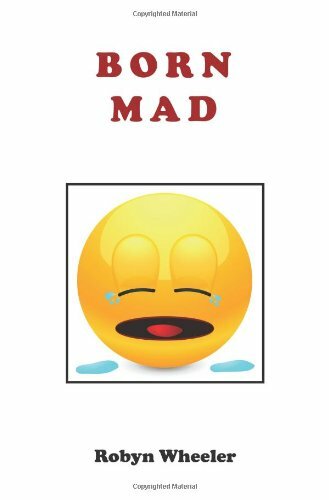 Born Mad is a book I would enjoy -- will look forward to your review!